It's the referendum that, for a moment at least, put a break on Brexit and drew a line under the hard border. A new 'people's vote' on television to find Britain's favourite snacks has revealed that when it came to the crunch the nation is totally divided over potato crisps. And fuming fans of Northern Ireland's famous Tayto crisps were quick to put the bite on Channel 5 after their prime time show at the weekend ignored the Tandragee treats in their top 20. The 'snap election', which saw Walkers crisps stroll off with the title ahead of Pringles and Doritos, sparked a furious outcry on social media across the UK and even hit the headlines in weighty national newspapers normally fixated with Brexit. Some posters branded the survey on Britain's Favourite Crisps "a national disgrace", a "total travesty" and "a fix". One even called it "Walkersgate". And there were accusations that some of the nominees in the top 20 weren't crisps at all. Some tweeters were all a-quiver about Quavers' inclusion and wondering what Wotsits were doing in the survey in the first place. On Radio 5 Live yesterday, a surprisingly lengthy amount of airtime on a programme which included updates on the Brexit crisis was devoted to discussions about crisps, with fans of Monster Munch the angriest callers about what bagged the crown. But in Northern Ireland there was more of a tongue-in-cheekiness flavour to the debate. 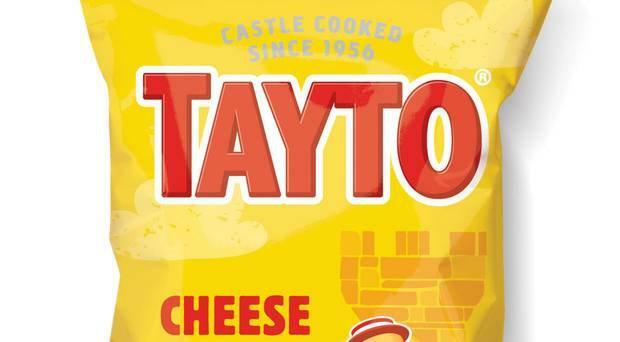 Some local crisps fans jokingly claimed the omission of Tayto cheese and onion was "a hate crime against the people of Northern Ireland" and "racist", while others said it was a "sin". One man even wisecracked: "Blame the DUP." Among the celebrities who picked their favourite crisps was English comedian Hal Cruttenden, who is married to a Northern Ireland woman, but he didn't choose any Tayto flavours. The only mention Tayto got during the marathon two-hour show was in relation to Golden Wonder crisps, which did feature among the British favourites at number seven. The show said that Golden Wonder had been taken over by "Irish crisp kings Tayto in 2006". But really that is just the crisp of the iceberg. Tayto - set up in 1956 by the Hutchinson family - have gobbled up many of their mainland companies like Mr Porky, Ringos and Jonathan Crisp in recent times. And they are now one of the largest snack manufacturers in the UK. A company insider said that Tayto's absence from the light-hearted TV survey wouldn't cause them any major concern. He added: "And anyway the programme was called 'Britain's favourite crisps' so it could be argued that it was referring only to the market across the water. "We know how people in Ireland feel about Tayto." There are of course two Tayto firms in Ireland. And after the Channel 5 show the social media messages from Irish posters opened up another long-running debate about which Tayto crisps are better, the Northern Ireland ones or the Republic crisps, which are produced in Co Meath.